Some nutrition experts call the avocado a super food. This flavorful fruit provides health benefits when you add it to your favorite dishes. But when you look at avocado nutrition, you might be surprised. Not only are avocado calories high, but most of the calories come from fat. So should you include this fruit in your diet? Many healthy eaters do, but only in moderation. The number of calories in avocado will depend on its size. The avocado nutrition facts shown are for a medium-sized avocado, but many avocados are smaller and some can be much larger (up to 200 grams or more). According to the USDA Nutrient Database, there are 322 calories in a larger (200 gram) avocado. But regardless of size, you probably wouldn’t eat an entire avocado in a single sitting. So it's more helpful to look at avocado calories per serving to see how your avocado calories add up. If you spread a thin layer of avocado on your sandwich or add a small amount to your healthy taco you are probably consuming roughly 30 grams or about two tablespoons of fruit. Of course, you may not use a tablespoon to measure the fruit. Most of us just slice a wedge or divide the avocado into quarters to get the portion we want. If you eat one-fifth of an avocado—that's a little less than a quarter of the fruit—you'll be consuming roughly two tablespoons of avocado or 50 calories. And what about avocado calories in guacamole? Generally speaking, a single serving or two tablespoons of guacamole contains 50 calories, 4.5 grams of fat (2.5 grams saturated fat), 240 mg of sodium, and 3 grams of carbohydrate, and 1 gram of protein. As long as you're mindful of portion size, it can be a heart-healthy addition to your meal. Most of the carbohydrate in avocado comes from fiber. A whole avocado provides about 12 grams of carbohydrate and nine grams of fiber. A larger avocado may provide up to 13.5 grams of fiber. A single serving of avocado provides about 2.5 carbohydrates and two grams of fiber. The glycemic load of a single serving of avocado is estimated to be one. Most of the calories in avocado come from fat. A whole avocado contains about 21 grams of fat, but mostly in the form of healthier monounsaturated fat. A larger fruit (201 grams) provides up to 30 grams of fat, 4.2 grams of saturated fat, almost 20 grams of monounsaturated fat, and 3.6 grams of polyunsaturated fat. A single serving of avocado provides less than one gram of protein. A whole avocado provides less than three grams of protein. If you consume just a single serving of avocado, it won't provide substantial vitamins or minerals simply because the amount you eat is very small. But a whole avocado is a good source of vitamin K, vitamin C, folate, vitamin E, riboflavin, niacin, and pantothenic acid. Minerals in a whole avocado include magnesium, potassium, copper, manganese, and and magnesium. Even if you eat more avocado than you should, you are still providing your body with health benefits. Avocados are high in fat, but they are not high in saturated fat. Instead, they provide a healthy dose of monounsaturated fat, considered a "good" fat. Monounsaturated fat or MUFAs come from plant sources and may be helpful in lowering your LDL or "bad" cholesterol. For this reason, the Academy of Nutrition and Dietetics recommends that you choose foods with monounsaturated fats instead of saturated fat. Avocados also provide fiber. Eating foods with fiber can help you to feel fuller and more satisfied. Healthy eating and weight loss experts generally recommend that dieters consume foods with fiber to help them eat less and create the calorie deficit needed for weight loss. Avocados may also provide benefits for people with diabetes. Although avocados have carbohydrates, they are very low on the glycemic index—rating less than 15— and won't spike your blood sugar. The glycemic index is a scale from 1 to 100, with high numbers indicating foods that raise your blood sugar faster. Avocados are a good choice when you have diabetes, especially when you use them to replace higher-glycemic foods. They can add variety to your diabetes meal plan, or make a quick snack as a dip for celery, carrots, or other vegetables. 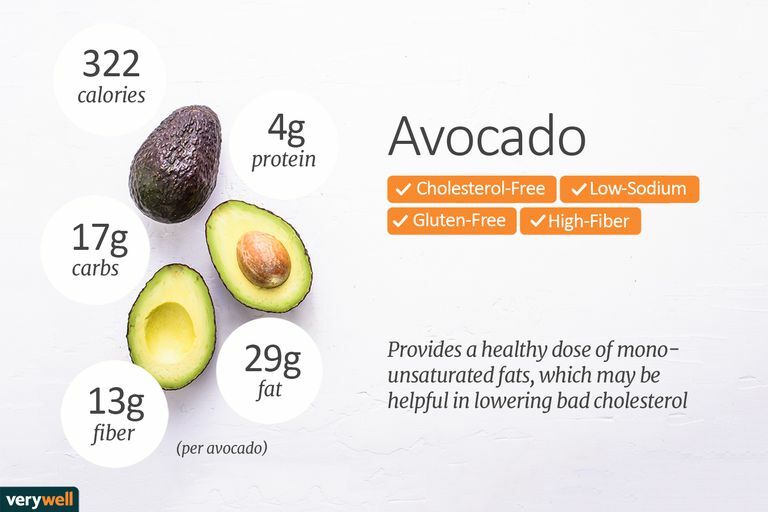 The American Diabetes Association recommends replacing dairy with avocado for morning smoothies, using it on whole grain toast as a cholesterol-free spread, in salads, and to create sauces for dinner entrees. Since avocados are high in calories but they may provide benefits if you are trying to lose weight. The fat and fiber can help you to feel full and satisfied. You can keep this creamy food in your diet, but you need to be careful about how much you eat. You can use avocados instead of other spreads or toppings that provide less healthy fats, like butter or margarine that may contain saturated fats or trans fat. As long as you keep your avocado calories in control and eat just a tablespoon of avocado (or even slightly more), you'll be doing your diet a favor. What is the best way to choose an avocado? The Hass Avocado Board recommends that you use both color and feel to find the best fruit. First, choose an avocado with a dark but consistent color. Take it in the palm of your hand and gently squeeze it. If it yields slightly, it is ripe and ready to use. What is the best way to store an avocado? If you eat your avocado just a tablespoon at a time and you hate to waste food, use smart storage tips to keep your avocados fresh. Many cooks add lime or lemon juice to their fruit so that they can eat just a small amount and save the rest for later. How long will avocados stay fresh? You can store ripe, uncut avocados in the refrigerator for 2-3 days. What is the best way to ripen an unripe avocado? To ripen an avocado quickly place it in a brown paper bag with an apple or banana for 2-3 days. Can you freeze an avocado? You can freeze an avocado, but many cooks say that it changes the texture of the fruit. The hardest part of cooking with an avocado can be removing the skin. Use these tips to peel your fruit. Start at the top of the avocado and slice it lengthwise from the top to the bottom. Then twist it to pull the two halves apart. To remove the pit, stick the knife into it and twist it out, then discard it. This should result in two halves with the meat of the avocado unmangled. Score the avocado in rows, up and down and then side to side to make a grid. Now you can scoop out these cubes with a spoon and discard the peel. Your avocado cubes are now ready to use. Sliced avocado is a great addition to a healthy sandwich or wrap. It provides a creamy texture and allows you to eliminate the butter or mayo. Many people also add avocado to an omelet or on the side of scrambled eggs. Try these avocado recipes to include the fruit in more of your meals. People with oral allergy syndrome may experience an allergic reaction when eating an avocado, also called pollen-food sensitivity syndrome. You may experience an itchy mouth or lips when exposed to the fruit. According to the American College of Allergy, Asthma, and Immunology, oral allergy syndrome is rarely associated with symptoms beyond the oral cavity such as hives, breathing difficulty, or anaphylaxis. Avocado may decrease the effectiveness of warfarin (Coumadin). If you are taking the medication, check with your healthcare provider for a personalized recommendation. Avocados: delicious and nutritious. American Diabetes Association. Web. 2016. Choose healthyfats. Academy of Nutrition and Dietetics. Web. 2016. What's So Healthy About Rutabagas?